For coffee enthusiasts, there’s nothing better than being able to make the right cup of coffee - with the least amount of trouble. This is possible only with the right French ﻿﻿Press. That’s why we decided to put together a review on LINKYO Coffee French Press. It’s been there on the market for a while now, and we could hardly find any gripes about it. Read on to discover why. LINKYO Coffee French Press is one of the quickest and easiest to use in its class. This comes as good news to almost anyone rushing to pour that morning brew in perfect condition. The plunger system is very sturdy and loved by many. It comprises of dual stainless steel filters that do an excellent job at straining out sediments from your coffee. You’ll be surprised when you sip down to the last drop from your cup! These filters reusable and long-lasting too. As if that isn’t enough, the package includes a second set of mesh filters. The carafe is very well insulated. It has double walls of stainless steel even on the lid - sealing off heat losses for many hours straight! It stays cool to the touch as well, so you need not to fear about the wandering hands of your children from touching the pot. LINKYO needs about 4 minutes to extract the flavours from your favourite coffee grounds. Then you can press down the plunger and enjoy a delicious, pipping hot cup of coffee without any hassle. Inspired by the soft curves of a tea pot, LINKYO ﻿﻿Coffee French Press is made to blend in perfectly with your kitchen décor. The polished mirror finish only serves to heighten its beauty by remaining spotless throughout its life. It has a flat lid with an elegant handle on top. 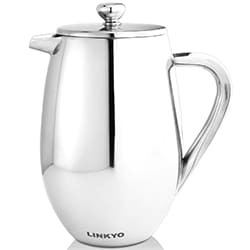 The carafe’s stainless steel handle lies on the opposite side of the spout. It has a solid grip that can be used stylishly to serve your guests. All its components are made up of stainless steel. This alone makes the French Press stand out from its competitors and last longer. Be rest assured you’ll fall in love with the looks and feel of it right out of the box. If you’ve owned a glass French Press before, than you’d know how painful cleaning can get. But the good news is that - this French seems to have one good news after another - it’s pretty easy to clean. The parts, especially the filter, comes off easily for cleaning. The design also facilities quick removal of sediments without catching them into crevices. It comes with the added benefit of being able to be washed in a dishwasher. If this got you worrying about corrosion, or signs of wear, then don’t be. The mirror finish will live through any challenge. For loners, brewing one cup of coffee at a time may not be possible with LINKYO. The plunger doesn’t reach a low amount of water well, making the coffee loose its flavour. Also, be ready to deal with a screeching sound when pressing the plunger down. Though these are not deal breakers, we still wanted to give you a heads up before placing a buy. If the taste of your cup matters as much as your next breath, and if you want to do it with the least hassle - then give LINKYO French Press a go. The usage of reusable filters instead of paper filters make a huge difference. This French Press will make you see just how huge it is. It’s also environmentally friendly without any plastic wastes, so consider this as another step you can take to go green. There isn’t a single coffee snob we’d want to warn off from buying the LINKYO French Press. It’s one of the best models we’ve come across - not to mention at a low price point. LINKYO is a durable brand that has been winning customer hearts for a while now. This stainless steel model is no different. It brews great-tasting coffee with minimum hassle, is very durable with no plastic parts, and looks good on your coffee table. The price can’t get any better either - which makes it a must-buy.